Having trouble viewing this email? See the online version here. To unsubscribe, please reply and request removal. Submissions of 303rd Bomb Group related stories and articles are most welcome. an American Heavy Bomber over Germany? 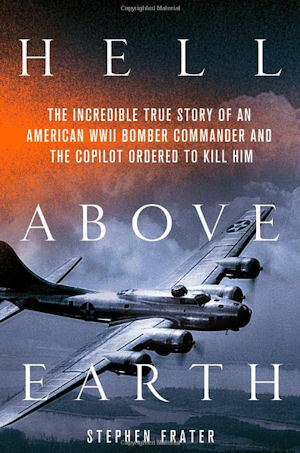 Portions of this article are drawn from the book HELL ABOVE EARTH: The Incredible True Story of an American WWII Bomber Commander and the Copilot Ordered to Kill Him, by Stephen Frater. The book is now available online and at major book stores across the country. It is also available as an audio book. “What the hell was Herman Goering’s nephew doing piloting an American heavy bomber over Germany?” was a question military and civilian intelligence struggled with and prepared for, with extreme prejudice, if, and when the need arose. Werner Goering couldn’t shake reminders of his famous uncle, Herman W. Goering, head of the Luftwaffe and Adolf Hitler’s legal successor. In the skies over the European theater, he did his best to reclaim the family name. U.S. Army records confirm that Werner, a 21 year old “Mighty Eighth” Army Air Force captain in early 1945, commanded 49 “Flying Fortress” combat missions over Nazi-occupied Europe—well beyond the 30 sorties that then constituted a squadron lead-pilot’s tour of duty. He could have gone home by Christmas of 1944, as most of his original crewmates did, but at the peak of the bloody air war, Werner signed on for a second tour with the British based 303rd Bombardment Group, “The Hell’s Angels,” one of America’s most storied warrior fraternities and the single most active bomber group in the Army Air Force. He fought until the bitter end—to the May 8, 1945, Nazi surrender. 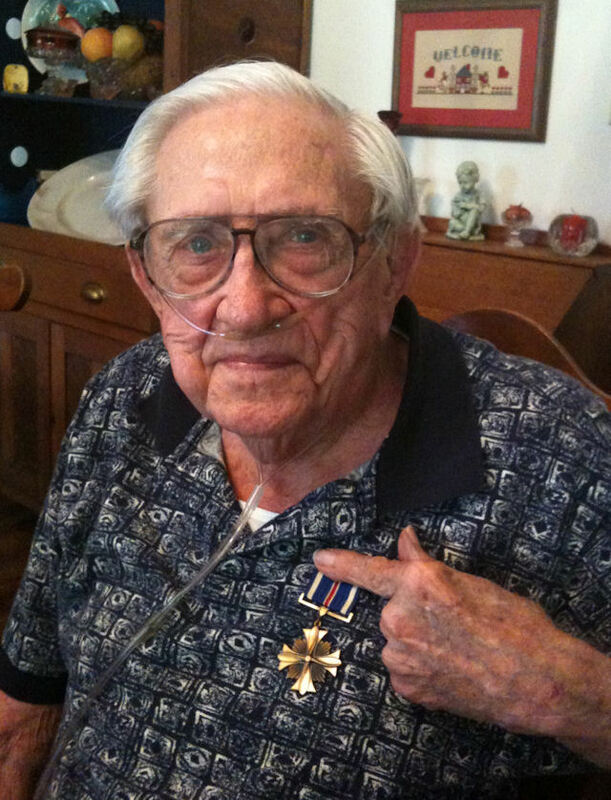 Among a fistful of other medals, he received the Distinguished Flying Cross, one of the nations’ highest military decorations, while quietly carrying the burden of his blood-soaked surname throughout the war and beyond. He battled the Nazi war machine in the war’s longest and deadliest battle for Americans, was nearly assassinated by a suspicious U.S. government, and faced the distrust of other officers. Before the Second World War, no one had seen anything like the terrifying spectacle of hundred-mile-long armadas of 2,000 plus bombers and fighters regularly and methodically razing the continent. Day after day, night after night, airmen took flight over Europe, bombing and strafing factories, ports, and cities, killing hundreds of thousands of civilians in the process. Across Nazi-occupied Europe, a calculated mixture of incendiary and high explosive bombs obliterated buildings that had stood for centuries. Fire- driven, oxygen sucking winds whipped flames into pyres of biblical proportions; some were hundreds of feet high and as wide as city blocks – convenient homing beacons for subsequent waves of bombers. Automobiles and streetcars melted in temperatures reaching 2,000 degrees Fahrenheit. Asphalt ignited and flowed like lava. People who sought safety in water towers, ponds, and fountains were trapped and “boiled alive”. (Footnote: quoted material from Bomber Command by Sir Max Hastings. Those who sought shelter in basements suffocated. In 1945, Newsweek, referring to civilian bombing, published the article “Now Terror, Truly.” Dresden historian Marshall De Bruhl wrote in his book Firestorm: Allied Airpower and the Destruction of Dresden that “in less than fourteen hours, the work of centuries had been undone.” The scene was similar in other major German cities; Cologne, Hamburg, Munich. Most of Berlin was demolished. Toward the end, it was ceaseless: almost three-quarters of all the Allied bombs dropped on Europe fell during the final 12 months of the war. By May 1945, up to 80 percent of some of Germany’s major urban centers were wiped out and up to 650,000 civilians lay dead, 16 percent of them children. Another 800,000 were wounded. In France, 70,000 civilians died, in Italy another 50,000. During the war, the Western allies killed “two or three German civilians by bombing for every German soldier they killed on the battlefield.” It was literally hell on earth. It was 1943 when the Army tossed Werner, a 19 year-old former slacker, who graduated at the bottom of his high school class, the keys to a new 4,800 horsepower warplane that topped out at 302 miles per hour and could obliterate an entire postal code. His B-17 heavy bomber would carry two and a half tons of explosives and cruise at altitudes three times higher than a man can breathe. As a new pilot, Werner had one of the most dangerous training assignments in the Army—15,000 fellow air cadetswould die in stateside accidents without ever seeing combat. He also would be responsible for the lives of 10 highly-trained youngsters; a ton of intelligence and signals data; a top-secret Norden bombsite; and a hell of a lot of firepower. For the tall, handsome, squeaky-clean, blonde and blue-eyed Mormon son of German immigrants, this was as good as it got. While other questioned him, he would reclaim the Goering family name in the skies over Germany. After completing basic flight training, and a 100 hour B-17 training course as flight commander, Werner was sent to the Eighth Replacement Wing in Salt Lake City for crew assignment, when his military career suddenly and inexplicably stalled. Pilots and crew were being formed up and shipped out daily, yet Werner languished in limbo for months. J. Edgar Hoover investigated Werner thoroughly and although there was no evidence that he or his family were anything other than loyal Americans, Hoover would not risk it all on the 19 year old, “bull headed, difficult, loner,” Werner Goering. It would be a huge coup for the Nazis’ and a great embarrassment to Hoover and the Army if the Nazis got hold of Werner, even if he remained a loyal American officer as a prisoner of war. And if he didn’t remain loyal, it would be even worse. On the other hand, if Werner completed a European combat tour successfully, or died fighting the Nazi war machine, there would be a useful German-American victory for the Allied cause. So, the top-secret order went out from the director of the FBI: Find someone to place in the co-pilot’s seat next to Werner with orders to shoot to kill, if for any reason – a treasonous decision on Werner’s part, enemy fire, or even mechanical failure – their plane can’t back get to its base or to another Allied airfield. Hoover was taking no chances and ensured, if Werner’s “Flying Fortress” was downed over Nazi-occupied Europe, someone would be in the cockpit to eliminate the problem. Military intelligence and the FBI decided they’d never let Herman W. Goering, get his chubby, jewel-encrusted hands on his nephew. Werner Goering would never land alive in Nazi-occupied Europe; if the Germans didn’t kill him, the Americans certainly would. The FBI and the Army would not prevent Werner Goering from serving his American homeland in war, but neither would they risk the propaganda coup that his desertion, or even his live capture, would represent for Nazi Germany. In early 1943, FBI agents fanned out across the United States to find a man capable of, and willing to shoot Werner dead in the cockpit; and one who could then get the plane back home. They found Jack Rencher, 23, a tough, insular, B-17 instructor in Yuma, Arizona, who also happened to be one of the Army’s best shots. He was the eldest son of a hard-drinking, no-nonsense, old-school, World War I infantry veteran and Arizona Sheriff named Guy Rencher, who wore a six-shooter until the day he died. Jack grew up “with a pistol in his hand.” Even better, from the FBI’s perspective, Jack was half-Jewish on his mother’s side and considered Nazis beneath contempt. He was the right man, with the right skills, in the right place, at the right time. In 1944 at 4:00PM on March 2nd then Second Lieutenant Edgar C. "Ed" Miller would likely have just finished intelligence debriefing and been winding down and relaxing after flying a 7 hour, 15 minute mission to bomb the V.K.F. Ball Bearing Works, in Frankfurt, Germany as co-pilot on the 1Lt. Earl N. Thomas crew in the B-17G Flying Fortress "Thru Hel'en Hiwater." As 1Lt. Lieutenant Vern Moncur, another pilot on the mission wrote: "This was an easy trip, but it could have been plenty tough if we hadn't had perfect fighter cover. Even then we were jumped by about fifteen Jerry's, but the P-51s soon made them 'hit the clouds.' We ran into our usual hot reception over Frankfurt from flak gunners down below. We always went over Frankfurt at pretty high altitude. It just wasn't healthy to go in at a lower altitude." Sixty-eight years later on Friday March 2, 2012 it was Ms. Suzanne Poole, daughter of retired Lt Col Miller who alone stood in the cold on the same hallowed ground of Molesworth, England that her father once trod. 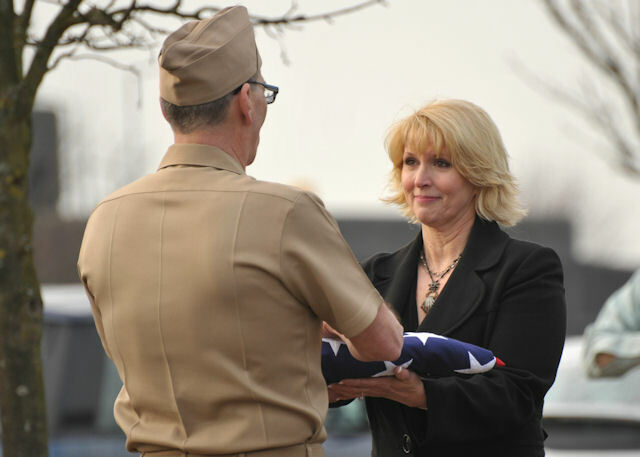 Ms. Poole, who lives with her husband Colin in an English town near the base, participated in a solemn ceremony in which a flag flown over Molesworth that day was lowered and solemnly folded by a U.S. joint service military flag detail. After a moving prayer from U.S. Air Force Chaplain (Capt.) David Reedy, the flag was presented to Ms. Poole by U.S. Navy Commander Denis Paskauskas of the U.S. European Command JIOCEUR Analytic Center located at today's RAF Molesworth in honor of her father. The same flag had earlier honored Lt Col Miller during his funeral in the States. Knowing of her father's close connection to Molesworth and its deep importance in his life, one of Sue Poole's first actions on hearing of her father's death on December 16, 2011 was to place beautiful flowers on the 303rd Bomb Group (Heavy) Memorial the very next day and write a sentiment in the visitor's book. She had been to the base before in February 2008 when she presented a set of books containing her father's extensive research into the men who served here with the 303rd during WWII. 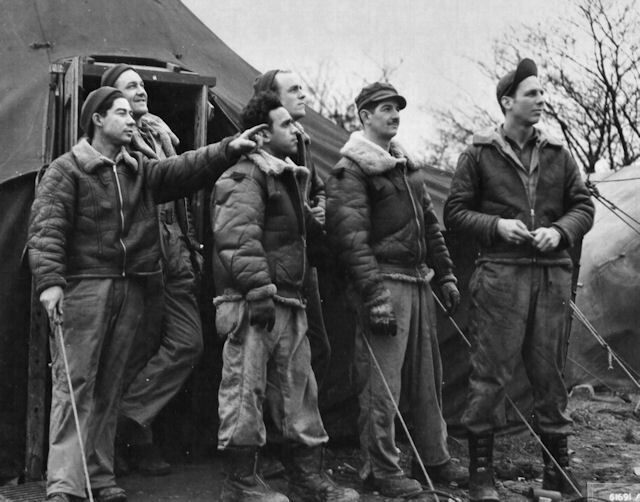 Ground Crew of B-17F 41-24562 Sky Wolf (358BS) VK-A watching for their plane to return. Sky Wolf was lost on January 11, 1944. Thanks to Daniel Bon for the photograph. 303rd BG Pilot Samuel W. Smith was just informed by his Congressman that he would receive the Distinguished Flying Cross for his heroic actions 67 years ago. We will publish details and photographs when they are available. Congratulations, Sam! Jack Hardwick proudly shows his DFC Medal. Jack was the navigator on the 360th BG Hector F. Vitale Crew. Larry Stacy of the Commemorative Air Force, Tex Hill Wing, located at Hondo Army Air Field, now the South Texas Regional Airport, recently video taped Jack's story as part of a video history of the air field. Larry reports that Jack recently lost his wife of 60+ years. He's a bit frail, but mentally sharp and a joy to visit with. Jack, your friends in the 303rd BG send our greetings and best wishes. Future issues of The Molesworth Pilot will take on a more compact format with the emphasis being reader submitted articles, current events and obituaries. There are hundreds of wonderful feature articles that could be reprinted from the Hell's Angels Newsletters, but I would rather let that historic publication speak for itself. Each article is worthy of being reprinted to a new generation of readers. Beginning with this issue, The Molesworth Pilot readers will also receive an historic issue of the 303rd Bomb Group Association's Hell's Angels Newsletter each month. In a separate email with the subject "Hell's Angels Newsletter: Historic Issues," an old issue will be emailed to the readers. The Hell's Angels Newsletter ran from April 1976 through November 2007 and includes 110 issues. It will take over 9 years to publish the complete set. Sincere thanks to the editors of the Hell's Angels Newsletter for their historic work. Most are gone now, but their legacy will live forever. The talented men in this very small club were: Albert E. "Al" Martel, Jr (April 1976), Harry F. Jenkins (Nov 1977 - July 1981), Wilbur "Bud" Klint (Jan 1982 - May 1985), Harold A. "Hal" Susskind (Dec 1985 - May 1998) and Eddie Deerfield (Nov 1998 - Nov 2007). When approached about this project, former Hell's Angels Newsletter Editor Eddie Deerfield, wrote, ". . . as the last surviving HANL editor I approve and applaud your plan to honor the 303rd's WWII accomplishments in such a unique way. The issues will appear month after month as a tribute to the memories of our veterans, long after almost all of us are gone. The wonderful continuing saga of the Hell's Angels Newsletter and, of course, The Molesworth Pilot." I encourage readers to submit articles about your missions, WWII experiences or those of your family and friends for publication in The Molesworth Pilot and hope you will enjoy the new format. 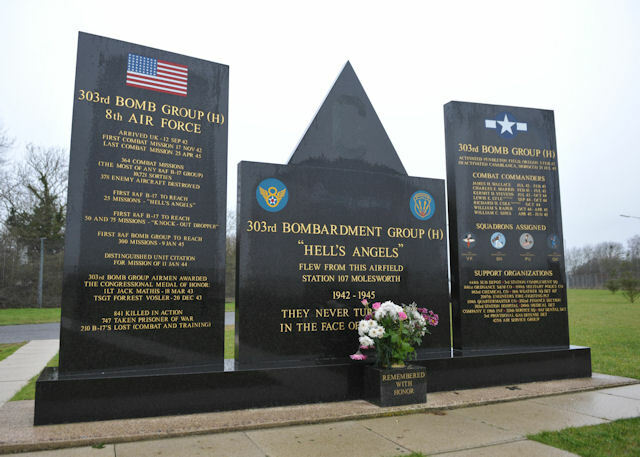 Veterans and family members of the 303rd Bomb Group are able to visit the home of the 303rd at RAF Molesworth located near Huntingdon, Cambridgeshire, England some 80 miles northwest of London. 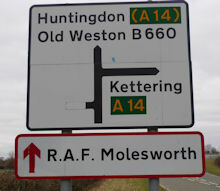 As RAF Molesworth continues as an active U.S. Base today with an important mission, admission to the base is necessarily strictly controlled for security reasons. 303rd family members wishing to visit may contact the base historian Mr. Peter Park at peter.park@jac.eucom.mil who can advise on military entry procedures, information needed from potential visitors, and possible visit dates. Robert Lane Bates, 89, died March 10, 2012 at his home in Great Bend. He was born June 16, 1922 at Hingham, Mass., the son of Fred and Helen (Lane) Bates. Mr. Bates married Phyllis Kolterman November 2, 1952, in Topeka. They were later divorced. He then married Neoma L. (Dennis) Williams Nov. 8, 1975, in Great Bend. She survives. Mr. Bates had been a Great Bend resident since 1953 coming from Topeka. He was a graduate of the Boston University School of Law and was an attorney having practiced in the Great Bend area for more than 60 years. He served as Probate Judge, Municipal Judge, and Assistant County Attorney. Mr. Bates served our country as a member of the U.S. Army Air Corps and the U.S. Air Force for about 10 years including World War II and during the Korean Conflict. That service was as the Navigator of a B-17 crew and training bomber crews at Forbes Air Force Base in Kansas during the Korean Conflict. Mr. Bates was involved in the Unification of the Great Bend School District No. 1 and No. 7. He was a member of Trinity United Methodist Church, Great Bend, where he held many church offices and led four Disciple Classes. He served as the Great Bend USD 428 board attorney for almost 30 years. He assisted with the organization of the Barton County Community College and served as the Community College board attorney for 10 years. He helped organize the USD 428 Foundation. He has been an active VFW and American Legion member. He served a term as Post Commander of the American Legion Post. He has a long history of membership in the Great Bend Chamber of Commerce and served on the Board of Directors. During the Mayorship of H.C. Davis, he served on the Great Bend Arts Council. In the early 1960s, he assisted with a reorganization of the United Way. He helped guide the development of the Barton County Mental Health Association. He also volunteered as a member of the Retired Senior Volunteers Corps. He was a longtime member of the Kiwanis Club of Great Bend, in which he served as President, Board of Directors, District Lt. Governor, on many committees, and was the recipient of the club sponsored “Making Great Bend Greater,” award. He was an avid K.U. Jayhawks and Boston Red Sox fan, and enjoyed playing golf. Survivors include his wife, Neoma Bates, of the home; two sons, James Robert Bates and wife Jennifer, Denver, Colo.; Dennis Lane Bates and wife Lisa, Lincoln, Neb. ; a step-son, Darren Williams, Great Bend; a daughter: Michele “Shelley” Bates, Great Bend; a step-daughter, Lisa Williams Thompson and husband Walter, Olathe; a brother, William Bates and wife Ella, Dover, Del. ; and six grandchildren, Jaxon Bates, Emma Thompson, Breanna Schartz, Brady Williams, Kori Birzer, and Brittney Birzer. A Memorial Service is scheduled at 11 a.m. Tuesday, March 13 at Trinity United Methodist Church in Great Bend with Rev. Jeff Slater and Chaplain Ron Moser officiating. Inurnment will be at Ft. Leavenworth National Cemetery, Leavenworth, with military honors conducted by the United States Air Force, at a later date. Visitation is scheduled from 9 a.m. to 8 p.m. Monday, March 12 with the family present from 6 to 8 p.m. at Bryant Funeral Home. Memorials are suggested to Trinity United Methodist Church, in care of Bryant Funeral Home. Fred E. Reichel Born April 6, 1920, Chicago, IL to Fred M. and Ruth F. (Oyen) Reichel. Died March 8, 2012, Rochester Hills, MI. He was preceded in death by his brother Lt. Lenard Reichel (USN), a naval aviator killed in action in WWII; his first wife Ione M. Reichel; and his second wife Catherine L. Reichel. He is survived by his sons Michael, Thomas and Robert (Claudia), grandchildren Will (Elizabeth), Tova, Aaron, Callie and Patrick, and great-granddaughter Mae. Fred spent much of his youth in Paw Paw, MI where he enthusiastically played baseball, football and other sports. He also developed a lifelong love of music from his widowed mother, a music teacher. After two years of college at Western Michigan, he enlisted in the Army Air Force in 1940. He was in transit to Pearl Harbor when WWII began but ordered to return to the U.S. Following rigorous flight training, Fred earned his pilot’s wings and was commissioned a 2d Lt. Assigned to the 8th Air Force, 303rd Bomb Group (“Hell’s Angels”), he served as co-pilot of a B-17 bomber until his plane was shot down on a combat mission over Germany in January, 1944. After making his first and only parachute jump (from 19,000 feet), he was held as a POW for 16 months. After WWII, Fred completed his education at the University of Michigan and the University of Detroit Law School. He later continued to serve his country as a dedicated Attorney Advisor in the Defense Department until his retirement in 1985. Fred enriched the lives of all he met. Whether mentoring younger lawyers in his office, golfing or playing cards with friends, helping neighbors with yard work, caring for others in need, devotedly following his Catholic faith, or delighting in his grandchildren and great granddaughter, he lived life with enthusiasm, warmth and generosity. He loved telling stories and sharing his unique sense of humor. To the end of his life, despite declining health, he impressed those around him with his unstinting good nature. Fred’s family and friends are very grateful for the loving care provided him by staff of the Sanctuary at Bellbrook and Mercy Hospice. And, even as we grieve, we celebrate his long life, a life well-lived and filled with love and service to others. Funeral Mass, Monday, March 12, 2012, 10:00am with an instate time of 9:30am at Sacred Heart Catholic Church, 3400 Adams Road, Auburn Hills. The family will receive friends Sunday, 2-7 pm at the Potere-Modetz Funeral Home, 339 Walnut Blvd, Rochester. Interment with Air Force Honors at Resurrection Cemetery, Clinton Township. In Lieu of flowers the family suggests memorials to the Alzheimer’s Association.